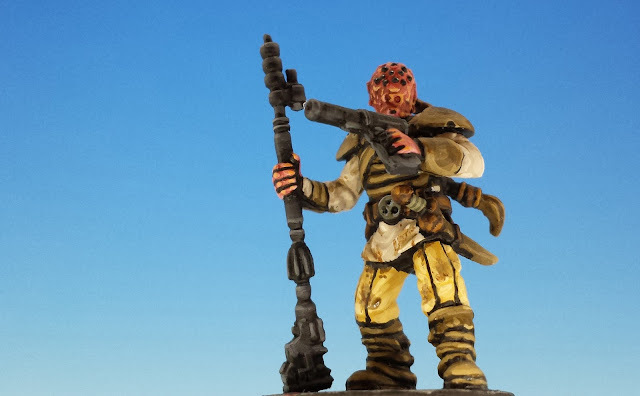 In order to spice up the miniatures for Jabba's Realm, I created some new conversions and home-brews, including Mutant Weequay Pirates and a miniature for Salacious Crumb, Jabba's court jester. I wanted some Mutant Pirates so that Jabba's gang would have the strangeness and diversity that it deserves, Usually I do my conversions using "authentic" Star Wars races, but this time, I thought the odder the better. 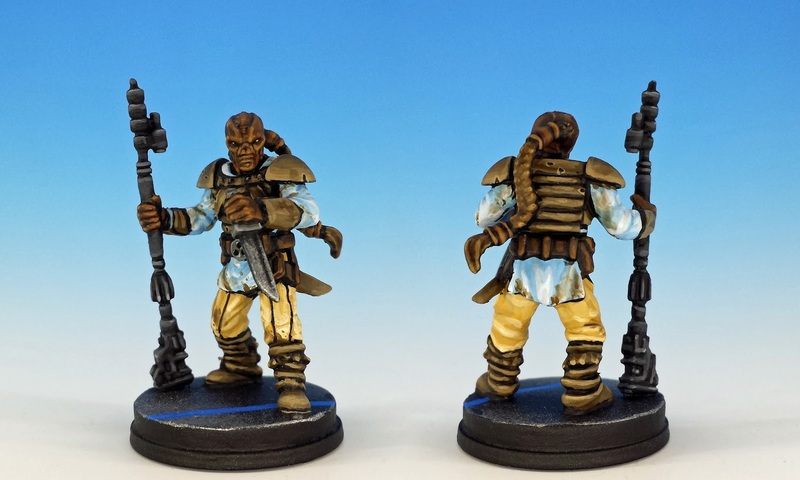 Thankfully I have recently discovered Ristul's Extraordinary Market (a great resource for any conversion work) and so ordered their excellent set of mutant heads. 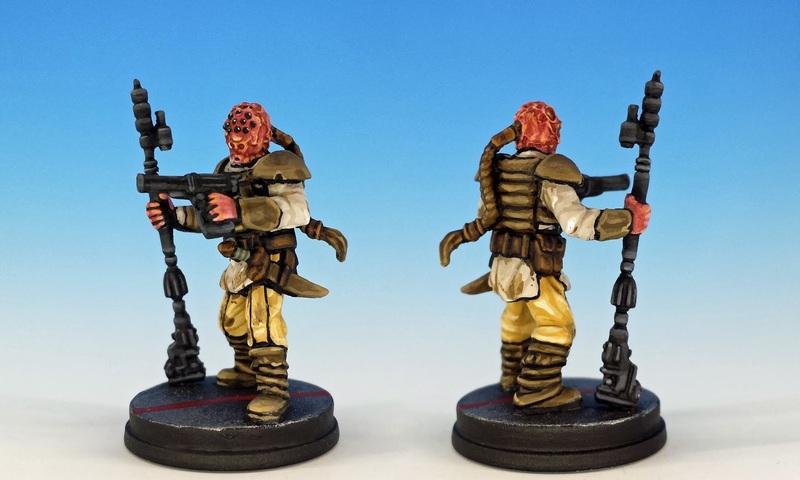 I replaced the original Weequay heads and substituted heavy blasters for the knives that the original models were carrying. Above, we have Old One-Eye, and below is his boon companion, Many-Eyes. I guess, in my own way, they are my tribute to Fritz Leiber's timeless wizards, Ningauble of the Seven Eyes and Sheelba of the Eyeless Face. Jabba's Realm also introduces new rules for an "Indentured Jester", a clear reference to the Hutt's evil muppet, Salacious B. Crumb. But unfortunately, Fantasy Flight Games provides no miniature to represent this cackling sycophant -- and indeed finding any kind of a 28mm miniature for Salacious is nearly impossible. 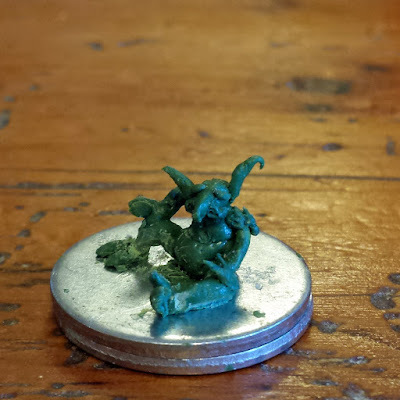 So I set out to do something I've never done before... create my own miniature using greenstuff. As it turns out, I am a terrible miniature sculptor. I realized that the raw sculpt might look passable, but that all of its faults and implausibilities reveal themselves once the painting starts. Apparently, Salacious is a "Kowakian monkey-lizard". 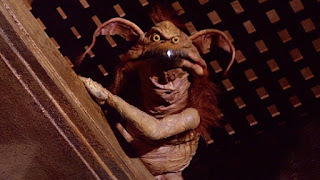 According to Star Wars lore, Salacious B. Crumb is a sort of Scheherazade character, with a situation not unlike The Thousand and One Arabian Nights. His deal with Jabba is that he must make the crime-lord laugh at least once every day... and if he does not, Jabba will eat him. But there's something that no one can explain. What does his middle initial stand for? My guess is "Bread". Well, in any case, as far as I know, Salacious is one of only two Star Wars characters with a middle name. Do you know who the other character is? 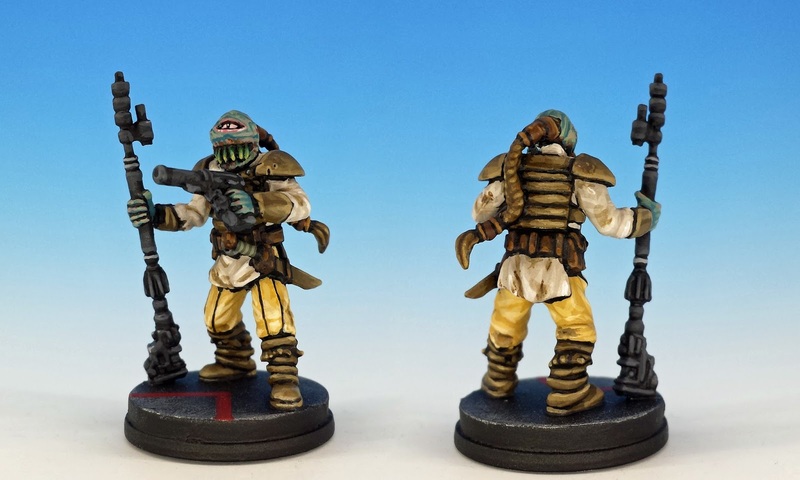 Fantastastic conversions! I love this project. Outstanding. Not only the conversions are cool, you just discovered a cool link to me, thanks! And the tiny Salacious is a wonderful surprise! Well done, slow clap!! Well, your IA conversions are a big inspiration for me, Suber, so right back at you. Great conversion work, Mathew. The little spot of reflected light on each of many-eyes eyes really brings him to life. It's the little things that make or break a paint job. I think that's right -- it's amazing how a little flare here or there can make a miniature with an otherwise standard paint job stand out. Well I'm glad you liked Salacious. 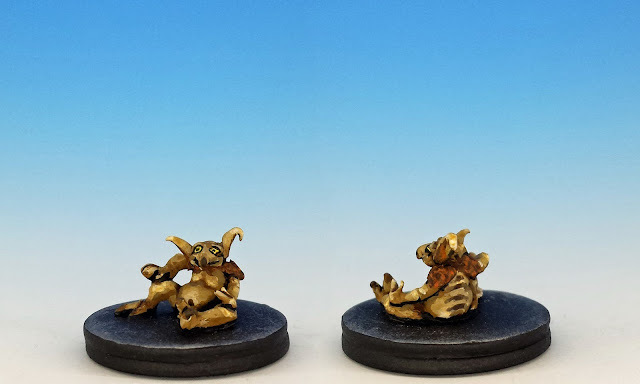 It was fun to start sculpting with something so small (even for a miniature). It meant that just getting the sense of gesture was more important than specific details. Just went scowering through the intenet for 15 minutes looking for the other fully named character. I've come up short, but I must know! The greenstuff sculpting looks amazing! Mugh better than I could do, and I've tried. You're too hard on yourself. Superb sculpting, I was wondering where you found the mini. I know the answer: it's Jabba T. Hutt. An excellent answer, Barks, but not entirely what I had in mind! I have no idea who else has a middle name. Cool conversions, I'm off to peruse Ristul's Market. It's got good stuff, no? Top quality scratch building work ! DING DING DING! We have a winner! Wicket W. Warwick is the only other Star Wars character I know with a middle initial / middle name. I love the headswaps and so forth. In the rpg games, there was always "near human" as an option for character species. Why not "near Wheequay"? Cheers, Dai! I appreciate your encouragement for the sculpting. I will keep at it. I really need to figure out what tools people use to do their sculpting, because I don't think fingers, toothpicks and an exactoknife are what the Perry Bros. use. I have some sculpting tools I picked up off of Ebay after a little research. Green stuff sculpting is way easier with some Silicon-tipped tools. "Clay Shaping Tools" is a good search parameter and a set should cost no more than $10-15 including shipping. They come in different hardness/firmness and I've found the firmer the better. Greenstuff tends not to stick to them hardly at all in my experience. I love the headswaps and, I was wondering where you found the mini.